This surgical malpractice claim was filed in Montgomery County against MedStar Montgomery Medical Center when a woman suffered a permanent neurological injury following spinal surgery. It was filed in Health Claims Arbitration on January 25, 2018, and it is the 43rd medical malpractice case filed in Maryland this year. This is the first orthopedic malpractice lawsuit filed in Maryland in 2018. A woman went to her orthopedic surgeon with complaints of lower back pain radiating through her left leg and foot. The surgeon ordered an MRI of the lumbar spine, which showed a recurrent herniation on the right side of her spine at L3-4. The left side of her spine appeared normal and healthy, and yet, the surgeon recommended that she undergo a revision laminectomy at L4 and a bilateral laminectomy at L3 and L5. In other words, the surgeon was planning on removing the back of several vertebrae on both sides, even though the MRI had shown herniation only on the right side, and the woman had only reported corresponding left-sided symptoms. The woman had the recommended surgery at a local hospital. During the procedure, the surgeon created and then repaired a dural tear (in the tissue covering the spinal cord). On the first day after surgery, the woman complained of numbness in her lower right leg from knee to foot and at the back of her right thigh, as well as a burning sensation in her right heel and spasticity in her right leg. She could not bear weight on her right leg, even though she had suffered no right-sided symptoms before surgery. The woman was administered Decadron, a steroid used to treat inflammation, but she did not improve. She was discharged three days later to a local rehabilitation hospital. Over the six days she spent receiving inpatient therapy, the woman's condition deteriorated. She developed urinary retention, requiring the use of a catheter, and by the time she left the hospital, she was unable to walk without the support of a walker. After her discharge, she returned to her orthopedic surgeon's office to report her symptoms. An MRI revealed a large hematoma at the surgical site, a persistent herniation at L3-4, and a slight narrowing of the spinal canal. Several days later, the woman underwent an additional surgery to repair the hematoma and another dural tear. After her second surgery, the woman continued to suffer from right leg numbness, an unsteady gait, and catheterization. She developed a postoperative fever, an elevated white blood cell count, sepsis, progressive blood loss, urinary tract infection, and a compressed nerve in the spine. The woman went through several courses of antibiotics and consulted with a neurologist, but she still has no feeling from her waist to her right foot, experiences chronic knee pain, and requires a wheelchair. It might seem as though the dural tear is to blame for all of the subsequent complications, but this sort of tear in the tissue covering the spinal cord is a common, minor complication of spinal surgery that rarely causes long-term problems. The woman's postoperative symptoms were very different from the symptoms of a dural leak, which most commonly include positional headaches, nausea, and dizziness. The woman's postoperative symptoms were likely caused by an L5 nerve injury, characterized by numbness, muscle weakness, difficulty walking, and pain radiating behind the thigh to the back of the calf and foot. 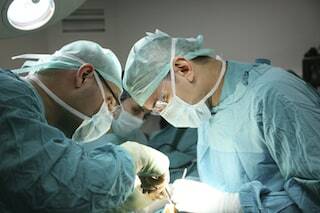 Performing a significant surgery without confirming any left-side lumbar abnormality and in the absence of any correlating right-side complaints. Failing to thoroughly inform the claimant of the dangers associated with the recommended surgery. Failing to provide more conservative treatment options. As a result of the defendants' negligence, the claimant is permanently disabled with a severe neurological injury. Read more about spinal cord and back injuries. Orthopedic malpractice cases are relatively rare. Here is another orthopedic negligence claim.